Jealous or is it Envy; Does it Really Matter? Both Are Sins! Home study am i sinning Jealous or is it Envy; Does it Really Matter? Jealous or is it Envy; Does it Really Matter? Why be jealous or envious? Jealousy – That passion of peculiar uneasiness which arises from the fear that a rival may rob us of the affection of one whom we love, or the suspicion that he has already done it; or it is the uneasiness which arises from the fear that another does or will enjoy some advantage which we desire for ourselves. ♦ A man’s jealousy is excited by the attentions of a rival to his favorite lady. ♦ A woman”s jealousy is roused by her husband’s attentions to another woman. ♦ The candidate for office manifests a jealousy of others who seek the same office. ♦ The jealousy of a student is awakened by the apprehension that his fellow will bear away the palm of praise. ♦ In short, jealousy is awakened by whatever may exalt others, or give them pleasures and advantages which we desire for ourselves. Jealousy is nearly allied to envy, for jealousy, before a good is lost by ourselves, is converted into envy, after it is obtained by others. —”jealousy.” Noah Webster’s 1828 American Dictionary of the English Language. H7068 The KJV translators used the word ‘envy’ and ‘jealousy’ both are from the Hebrew word H7068 קִנאָה qin’ah (kin-aw’) meaning ardor, jealousy or envy. ♦ Proverbs 6:34 “For jealousy H7068 [is] the rage of a man” (KJV) i.e., rage from the Hebrew חֵמָה חֵמָא chemah (khay-maw’) 1. heat 2. (figuratively) anger, venom, poison (from its fever); burning anger. G2206 Envy – in 1 Corinthians 13:4 the King James Version envieth is the Greek word ζηλόω zeloo (dzay-loh’-o) verb 1. to have warmth of feeling for or against; to be heated or to boil with envy, hatred, anger; be jealous over, envious or spiteful; to exert one’s self for one (that he may not be torn from me). * Based on my cursory research; should you find different information, please help me by sharing. Jealousy or envy is stimulated by a desire for something that rightly belongs to another (Genesis 30:1 and Proverbs 3:31). Intolerance of rivalry or unfaithfulness; a disposition suspicious of rivalry or unfaithfulness; hostility towards a rival or one believed to enjoy an advantage. Most often human jealousy involves hostility towards a rival. Jealousy is regarded as worse than wrath or anger (Proverbs 27:4). Jealousy (or bitter envy) is regarded in James as characteristic of earthly demonic wisdom (James 3:14) and as the source of all disorder and wickedness (James 3:16). Envy – Chagrin, mortification, discontent, or uneasiness at the sight of another’s excellence or good fortune, accompanied with some degree of hatred and a desire to possess equal advantages; malicious grudging; — usually followed by of; as they did this in envy of Cæsar. Jealousy is a strong and often a painful emotion aroused by the unfaithfulness of a husband or wife, but can include other family members or associates. The distinct difference between jealousy and envy is clear when associated with a marital relationship and faithfulness or trust; envy does not apply. Note: The law of jealousy (Numbers 5:11-31 (key verses: 14-15, 18, 25, 29-30) was instituted so that God himself could determine the guilt or innocence of a wife whose conduct was suspect but for whose guilt there was no proof. It was to the advantage of an innocent party to go through the ordeal and have her name cleared and her husband reassured. Note: parenthesis (#) encloses the key verse(s). Psalms 37:1-8 ( 1, 3-4 and 7-8); 73:1-28 ( 2-4, 12-14 and 21-24); Proverbs 6:20-35 ( 29, 32-35); 3:8; 12:4; 14:30; 15:30; 16:24; 17:22. Numbers 5:11-31 ( 14-15, 18, 25, 29-30); Ecclesiastes 4:4-8. Mark 7:1-23 (focus verses: 18-23; 22); Romans 1:18-32 ( 28-32). 1 Corinthians 13:4-8 (4); Galatians 5:16-26 ( 19-21 and 24-26); James 3:13-18 ( 14 and 16); 4:1-10 ( 1-3). James 4:1-3 What leads to strife (discord and feuds) and how do conflicts (quarrels and fightings) originate among you? Do they not arise from your sensual desires that are ever warring in your bodily members? 2 You are jealous and covet [what others have] and your desires go unfulfilled; [so] you become murderers. [To hate is to murder as far as your hearts are concerned.] You burn with envy and anger and are not able to obtain [the gratification, the contentment, and the happiness that you seek], so you fight and war. You do not have, because you do not ask. Jealous or Envious of others, does it matter? Both jealousy and envy are sins (works of the flesh; see Galatians 5:19-21) that will not end well. 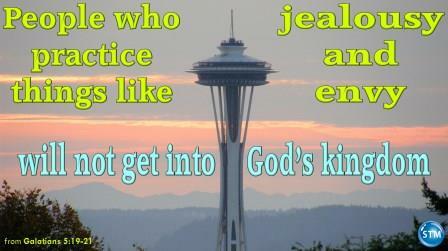 Those who are ‘being jealous’ or ‘feeling envy’ will not inherit the kingdom of God (New Century Version). So it is your decision, does it really matter which one a person struggles with? Is there anyone among you who is truly wise and understanding? Then he should show his wisdom by living right. He should do good things without being proud. A wise person does not brag. But if you are selfish and have bitter jealousy in your hearts, you have no reason to brag. Your bragging is a lie that hides the truth. That kind of “wisdom” does not come from God. That “wisdom” comes from the world. It is not spiritual. It is from the devil. Be blessed my friends and use self-control to subdue jealousy—♥ Tim. 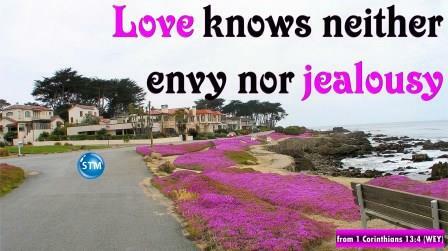 ♥ Question for “jealous”: Are you a jealous or envious person? See what is available on the Sound Truth Ministry website. (AMP) Scripture quotations taken from the Amplified® Bible, Copyright © 2015 by The Lockman Foundation Used by permission. (www.Lockman.org) || Scripture quotations marked (CEV) are from the Contemporary English Version Copyright © 1991, 1992, 1995 by American Bible Society, Used by Permission. || (ERV) Taken from the HOLY BIBLE: EASY-TO-READ VERSION © 2001 by World Bible Translation Center, Inc. and used by permission. || (GNT) and (TEV) Scripture quotations marked (GNT) are from the Good News Translation in Today’s English Version- Second Edition Copyright © 1992 by American Bible Society. Used by Permission. || (ICB) Scripture taken from the International Children’s Bible®. Copyright © 1986, 1988, 1999 by Thomas Nelson. Used by permission. All rights reserved. || (KJV) King James Version 1769 revision – public domain. || (NCV) Scripture taken from the New Century Version®. Copyright © 2005 by Thomas Nelson. Used by permission. All rights reserved. || Scripture quotations marked (NLT) are taken from the Holy Bible, New Living Translation, copyright ©1996, 2004, 2007, 2013 by Tyndale House Foundation. Used by permission of Tyndale House Publishers, Inc., Carol Stream, Illinois 60188. All rights reserved. || (NOG) The Names of God Bible (without notes) © 2011 by Baker Publishing Group. || (RKJNT) Revised King James New Testament – public domain. || (WNT) Weymouth New Testament in Modern Speech Third Edition 1913 Public Domain. Welcome to a different type of ministry; we are primarily internet-based, we NEVER ask for MONEY for anything we do. We are faith-based and solely rely on God to give what we need. Your attention and time to check what we freely give is all we ask of you and that you be blessed by this ministry. Sedition in the Church; Is God Pleased with Division? Do not be jealous of others. The updated Bible study ‘Jealous or is it Envy; Does it Really Matter?’ is ready for you: http://wp.me/s4dhin-jealous <<– the link to this page. Galatians 5:19-21 The wrong things the sinful self does are clear: being sexually unfaithful, not being pure, taking part in sexual sins, 20 worshiping gods, doing witchcraft, hating, making trouble, being jealous, being angry, being selfish, making people angry with each other, causing divisions among people, 21 feeling envy, being drunk, having wild and wasteful parties, and doing other things like these. Living a Christian life requires changes in the way we think and act. Being jealous (jealousy) and feeling envy (being envious) of others are two of the behaviors we must be aware of. In order to make changes, we first must acknowledge a need for change. Are you prone to being jealous or feeling envious of others? This Bible study addresses the issue to assist in making changes. Have a wonderful day; be blessed—♥ Tim. If this summary and/or the Bible study helped you, please share, tell your family and friends! ♥ Question for the day: Do you or someone you know struggle with jealousy or envy?